Scott hasn’t always been so positive. He experienced hardships growing up on the east side of San Antonio in what he calls a “trap house.” There, he experienced high poverty for most of his childhood, was exposed to bad influences and was even homeless for a while. The person who sparked Scott’s ambition and drive for learning was his basketball coach and English teacher, Mr. Bego, who taught him about success and how to impact others. Scott earned a bachelor’s degree in political science/history at St. Mary’s University, a master’s degree in educational psychology/counseling at University of Texas at San Antonio and a doctoral degree in organizational leadership at the University of the Incarnate Word at San Antonio. His research dissertation, “African-American Male Academic Success,” studied what barriers prevented African-American males with advanced degrees from progressing with academia. 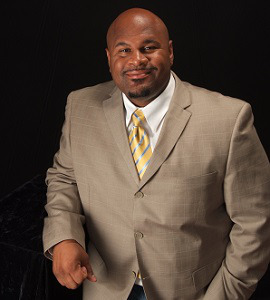 In addition to being a college professor, Scott is the executive director of the Community for Life Foundation, a scholarship fund that was founded by his pastor and mentor. The foundation has given over a half of a million dollars in scholarships to primarily underrepresented Black and Hispanic students and has frequent career-readiness workshops for students. He was also involved in the Talented 10 Scholars, a contortion of Black male doctors who follow the 15 young men from ninth to twelfth grade. His work within the community has yielded results, but the journey has not been easy. “What we did is we took the hardest school with a high concentration of African-American boys and we said ‘What are some of the issues?’, and we basically mentored them every week from 9th grade to 12th grade. 100 percent of them graduated,” he says. Dr. W. Sean Kearney, interim dean of the College of Education and Human Development at Texas A&M University at San Antonio, says that Scott has had an impact on both the college and the surrounding community. Kearney says that students at Texas A&M are drawn to him. “He can often be seen after class, in the hallway or in the parking lot engaged in extended conversations with students who would rather continue the classroom discussion than hurry home,” Kearney adds. Since beginning his tenure as a professor, Scott has taught several graduate-level courses such as Elementary and Secondary Schools and Administration of Various Special Programs. But his favorite courses to teach are Multicultural Education for Educators and School and Community Relations. In these classes, Scott has had the opportunity to push his students and has provided them access to a variety of speakers including school board executives, the mayor, parents, city councilmembers and other legislators to address a myriad of issues ranging from anti-bullying and anti-cyberbullying. He recently took some of his students to Spain to study the history and origin of the city of San Antonio. Monica Levitan can be reached at mlevitan@diverseeducation.com.